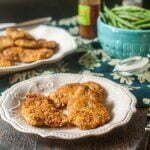 These low carb breaded pork cutlets are an easy and delicious dinner that only uses 4 ingredients. Only 0.2g net carbs per piece of breaded pork. Take the pork tenderloin and cut into 1 inch pieces. Place a piece into a baggie and using a skillet or meat mallet, pound the pork into thin pieces. Place the egg into a shallow dish and beat. In another shallow dish add the crushed pork rinds and Parmesan cheese and mix well. Dip the pork into the egg and then the pork rind mixture to bread it. Place on a dish until you finish them all. Heat the oil to medium high in a large frying pan. Place a few pieces of meat in the pan and cook for about 3 minutes per side or nice and brown. Transfer cooked meat to a baking dish and continue working in batches until all the meat is browned.